Well, maybe you've noticed that every time you turn around you seem to be running out of hours on your logbook. It seems several times per week you have to shut down a couple hours short of the customer and have to reschedule your load. Then you sit for a day or two afterwards. You talk to drivers that are turning 2800 miles per week but you can't figure out how to get more than like 1800 miles without running out of hours sometimes. What's the deal here? A lot of times drivers in this position would admit that it seems every time they have to shut down because they're out of hours their dispatcher seems annoyed. It's not the driver's fault he or she is out of hours, that's just the way the laws are written and yet it seems the driver gets punished for it by sitting a day or two afterwards. It's not the driver's fault he or she is out of hours, that's just the way the laws are written and yet it seems the driver gets punished for it by sitting a day or two afterwards. As a driver you can't PROVE they are punishing you, and nobody is actually saying you did anything wrong, but the pattern and the attitude your seeing sure suggests it. Well, the reason I'm writing this book is to explain the raw truth about the trucking industry. I'm not worried about what anybody will think about what I'm saying here. I'm just letting you know what to expect and clue you in to the REALITIES of life as a truck driver. I'm going to come back later on in this book to helping you deal with more of the people and systems at work within your own company. But first I have to take a long detour here to explain a number of important facts about life in the trucking industry so you will have a deeper understanding of all of the nuances involved with how you handle yourself, your company, and your career as a commercial driver. So here comes some of the coldest, hardest truths about the industry....it's time to start telling it like it is....so hang on to your seat....you may NOT like this next part. It's true. If the driver cheats on his logbook, everybody benefits. How is that? Simple...drivers get paid by the mile and so do the trucking companies themselves. So the more miles a driver runs in a given amount of time, the more money the driver makes AND the more money the driver's company will make. I'm just letting you know what to expect and clue you in to the REALITIES of life as a truck driver. 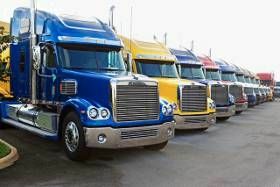 As an added bonus, the more miles you are turning per truck and per driver in a given amount of time the more efficiently you are moving goods for your customers overall. The more efficiently you move goods overall the more efficiently our economy runs as a whole. So as you can clearly see, if one driver can find a way to turn more miles in any given amount of time it benefits the driver, his company, the customers you are serving, and the overall economy as a whole. That's why governments on every level try to give the impression that they are serious about cracking down on drivers and companies that break the laws and yet in all reality they do very little or nothing about it. If they were to seriously crack down on the abuse they would be crippling our own economy.